The all-new 2015 Acura TLX is an effort to end an identity crisis in Acura’s sedan portfolio. Sales of the Acura RDX and Acura MDX SUVs have been climbing and now rank in the top five for luxury SUV purchases. The sales of the company’s sedans have been lagging. The TSX and TL crowded a space between the new gateway ILX model and the flagship RLX. Acura’s engineering team started working on a single replacement more than five years ago. The goal was to build a car smaller on the outside than the TL, but provide better performance than the TSX. Engineered and designed in the United States, final approval for the project was made in Japan. Designers worked on a performance inspired lower profile with a longer hood and short tapered decklid. Although the wheelbase is the same as the TL, the roofline is 12-millimetres lower and the overhangs front and rear of the wheels are 100-mm shorter. 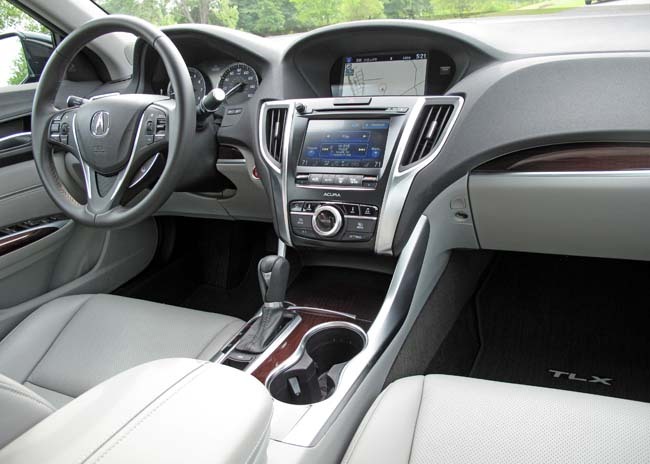 Interior room is more or less the same as the TL, which is a vast improvement from the rather cramped TSX. Cargo room in the trunk is 405 litres, and impressive 34L more than the TL. The TLX frontal area is 1.5% smaller than the TL and the drag coefficient has been reduced by 15%. Complimenting the vehicle’s appearance are jewel-like LED headlights that grace all TLX models. Styling closely follows the lines of the ILX and veers significantly away from the last TL, which many found controversial. Playing on Acura’s marketing tag line of “synergy of man and machine” the engineers wanted to create a sports sedan that would respond to the will of the driver. Any step up in performance starts with the chassis. Acura uses a combination of high strength steel and new forging techniques to create a chassis that’s significantly stiffer than either of the vehicles it replaces. One impressive addition is the hot stamped one-piece doorframe. 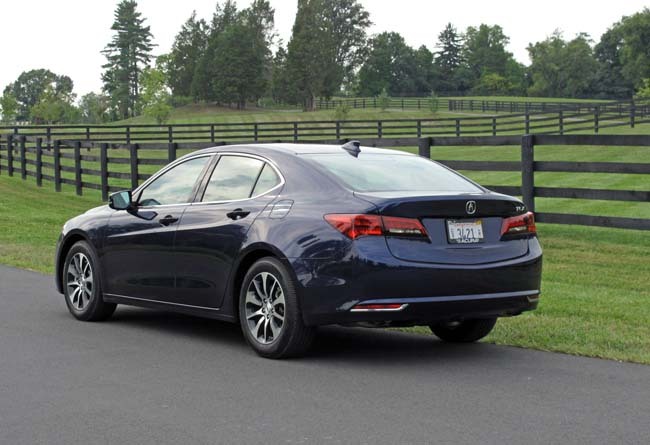 The improved structural integrity helped the TLX to receive top marks from both the IIHS and NHTSA as a top safety pick. In addition to the exterior shell the suspension mounts are also stiffer. Lead engineer Mat Hargett used a full size cutaway model to demonstrate the new and improved chassis. New stiffer suspension mounts enabled engineers to utilize softer rubber bushings for improved ride comfort while maintaining tight handling. To completely fill the gap left by the TL and TSX, Acura is offering two powertrains on the TLX. The base model will come with an all-new 2.4-litre gasoline direct injected inline four-cylinder that produces 206 horsepower at 6,800 rpm and 182 lb-ft of torque at 4,500 rpm. The new engine represents a five hp and 18 lb-ft improvement over the outgoing TSX engine. An 8-speed dual-clutch transmission with paddle shifters is the only transmission offered. Acura is utilizing a torque convertor with the DCT transmission for improved acceleration and to smooth out launches in city driving, The new powertrain improves fuel economy by about one litre per 100 kilometres in both city and highway cycles. Acura estimates a fuel consumption rating of 9.6 L/100 km in the city and 6.6L/100 km on the highway. 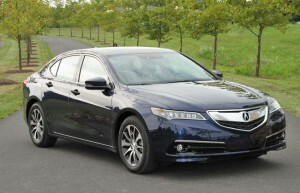 The direct injected 3.5L V6 used in the upscale model is the same unit found in Acura’s flagship RLX. 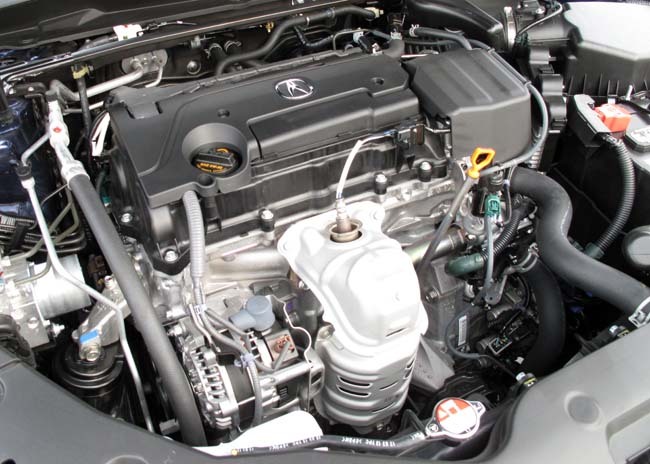 The engine utilizes variable cylinder management to run on three cylinders when the power demand is low, which delivers maximum fuel efficiency. In the TLX, the V6 produces 290 hp (20 less than RLX) and is paired to a brand new nine-speed transmission with paddle shifters. It was developed in co-operation with ZF in Germany. The nine-speed provides a blend of performance and economy, as the first seven ratios are lower than the entire full range of the previous TL’s six-speed transmission. Remarkably, fuel economy has been lowered by 0.6L/100 km in the city, while the top two gears increase fuel economy by 1.2L/100 km on the highway. 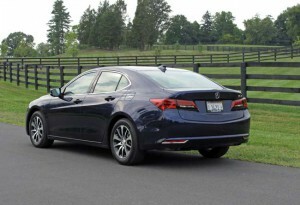 Acura claims the V6 returns fuel economy similar to that of the competitors turbo-charged four cylinder engines. Driving the TLX at the National Press Launch was a pleasant surprise. On the rural roads of Virginia and West Virginia the TLX proved to be a refined ride. Engine noise was restrained on the V6 model and noticeably louder on the 4-cylinder model when pushed hard. The four-cylinder was loud, but the sound was not harsh and it ran smoothly. Acura’s electro-mechanical Precision All Wheel Steering (P-AWS) comes standard on all TLX models. Super Handling All-Wheel-Drive (SH-AWD) with torque vectoring is offered on the V6 model. The all-new, next generation system includes a smaller, lighter rear differential than the unit used in the TL SH-AWD. Mat Hartig explained this is one of the main reasons the top of the line TLX Technology package model is 101-kilograms lighter than the comparable TL SH-AWD model. Despite the smaller size the differential unit maintains the older units durability matching its ability to handle up to 855 lb-ft of torque. The rear differential also enables torque vectoring to either of the rear wheels. At the press launch Acura’s engineers spent a considerable amount of time talking about the in cabin improvements. Another effect of the structural improvements is the improved noise, vibration and harshness (NVH) rating of the car. While better steel and improved welded would improve the NVH characteristics, Acura went one further by applying acoustic foam in 10 different spots including the areas around the door and A-pillar. It has the desired effect, as the TLX is very quiet. Acura has always been a brand that focused heavily on technology and the new TLX is jam-packed with a multitude of new systems that encompass comfort, convenience and safety. The list of acronyms is a dizzying, even the AcuraWatch safety system onboard contains a substantial list: BSI (blind spot information), FCW (forward collision warning), LDW (lane departure warning), LKAS (lane keeping assist system), RDM (road departure mitigation), ACC with LSF (adaptive cruise control with low-speed follow), CMBS (collision mitigation braking system). Acura stresses another first with the TLX is to integrate the systems into one cohesive safety system. One impressive feature combines the onboard camera systems with the built-in millimetre wave radar to assess threats in the vehicles path based on size and speed they are moving. The system can detect and warn of oncoming cars or pedestrians. Standard on all TLX’s is Acura’s Integrated Dynamic System (IDS). Choosing between, normal, economy, sport and sport+ tailors the engine, transmission, steering feel and throttle characteristics to the style of driving you wish to cover. In sport+ the transmission locks out the top two gears on either transmission and trends toward redline shifts. Using the manual paddle shifters locks out the automatic controller, but will allow the engine to match revs on downshifts creating a more stable and smoother drive. Acura’s reactive dampers in the suspension provide a very comfortable ride over all sorts of roads. In fact the TLX’s unruffled character could lead you to underestimate the vehicles capability. It wasn’t until we took the various vehicles through a series of tight private paved roads that the TLX showed its true colours. The V6 SH-AWD model felt sure-footed and quick. Over the test routes the handling difference between the V6 all-wheel-drive and the V6 front-drive unit was hardly noticeable. If tested in inclement weather the all-wheel-drive system would prove come into its own. Another reason for the limited differential was likely due to the presence of the P-AWS steering system on all TLX’s models. The system’s ability to keep the vehicles poise in lane transitions and through corners is quite impressive. The real surprise, however, was the 4-cylinder model. In sport mode the front tires were chirping on most normal launches and with a relatively broad powerband it was easy to keep the lighter TLX dancing through corners and bends. The real payoff with the new TLX is that even though it keeps you smiling when you want to put on your racing helmet most days we all just want to get from point A to point B safely and comfortably. Few luxury sports sedans solve that compromise as effectively as the Acura TLX, even fewer at this price point. The TLX is expected in Canadian showrooms in late August 2014 and the 4-cylinder model will start at $34,995 with the optional tech package adding $3,700 to the price. The V6 front wheel drive model commences at $41,995 but includes the tech package with the Elite package adding $6,600 to the bottom line. The SH-AWD option will only be offered with V6 power and is expected to go on sale later in 2014 at a starting price of $39,900 with no special packages included. The tech package adds $3,900 and the Elite is an additional $3,600. Fully loaded a 2015 TLX V6 SH-AWD with the Elite package lists for $47,490, about $2000 less than a comparably equipped 2014 TL, a more refined vehicle for less money.